The crew, as well as myself, were beginning to go a bit stir crazy waiting on the weather to change on the site. Each day, Gary and Greg got the same report, 4’ to 6’ seas. It almost felt unreal, that it would stay constant day after day and now going on two weeks. Of course the M/V Sea Hunter was capable of cruising in that that kind of weather but we were not able to work in it. It was too dangerous and a huge possibility of losing equipment. Now the Son Worshipper was a different story. She too was capable in that weather, but because of her style she rocked continually. I nicknamed her the puker. There is no way I could ever work on that ship while at sea. Greg would love to kid me at times, saying he was sending me to work on it. I would reply that I would quit first. (Well it may be a different story if we were in the Caribbean). Greg had hired a guy who owned a small plane to fly over our site periodically. He hadn’t been there in a while, so Greg suggested he do a fly over the next day. We again woke to the same weather report. However, the pilot called after flying over our site and had some disturbing news. He had spotted a government ship directly on our site. Of course, this got everyone talking and speculating. What would they be doing there? We had exclusive rights to the area. No one had contacted us about anything (not that the government needed to contact us regarding anything). There were lots of theories going around that day on the ship. Greg told us to just calm down and he would try and see if he could find anything out. He called his wife, Kathy, back home in Maine. On a hunch, he had her check the weather on our site from her home computer. Well, lo and behold, it was completely different than what we were getting on the ship. According to Kathy the weather was calm. It was perfect conditions for working our site. This was good news but also disturbing news. Could something or someone have rigged our computers? My initial thought was that now that we located it, the government was going to take the cargo without us knowing it. (Maybe I watch too much television). There really wasn’t any way of finding out what they were doing on our site, so we had to put it behind us and continue on. It was a good feeling to finally be going back to sea. The forecast looked great for the next five days. Everyone was in a great mood and couldn’t wait to get back to work. Leaving from Provincetown was a much quicker trip than leaving from Boston. At dinner that evening you could hear the excitement in the crew’s voices as they began making plans for the next couple of days. It was nice to hear them so excited again and getting along so well. Our first order of business was to retrieve a lost buoy and anchor. They were needed, not to mention expensive. At the site we hooked up to one of the remaining buoys while the Son Worshipper scanned the area. With good fortune both the anchor and buoy were located. The crew aboard the Sea Hunter was now ready to go to work. For those who have never worked aboard a ship, it’s difficult to explain how tough it can be. Even the simplest tasks take a bit longer, not to mention you always have to be on your toes. With wire and cables running the entire length of the deck, it is very dangerous. One slip up could be deadly. Wire and cables everywhere. A dangerous place to work. The guys worked throughout the entire day with only a 15 minute dinner break. They immediately went back to work as they were determined to retrieve our anchor. Around 9:00 pm, dirty and exhausted, they finally called it a night. Unfortunately the night was not over for some as there was still night watch duty. That particular night, not a soul stayed up to watch a movie. Showers and bed was all that was on their minds. I awoke early to cook a hearty breakfast as I knew it was going to be another long and tough day for the crew. One by one they awoke and consumed breakfast and endless cups of coffee. After a brief meeting everyone got back to work. 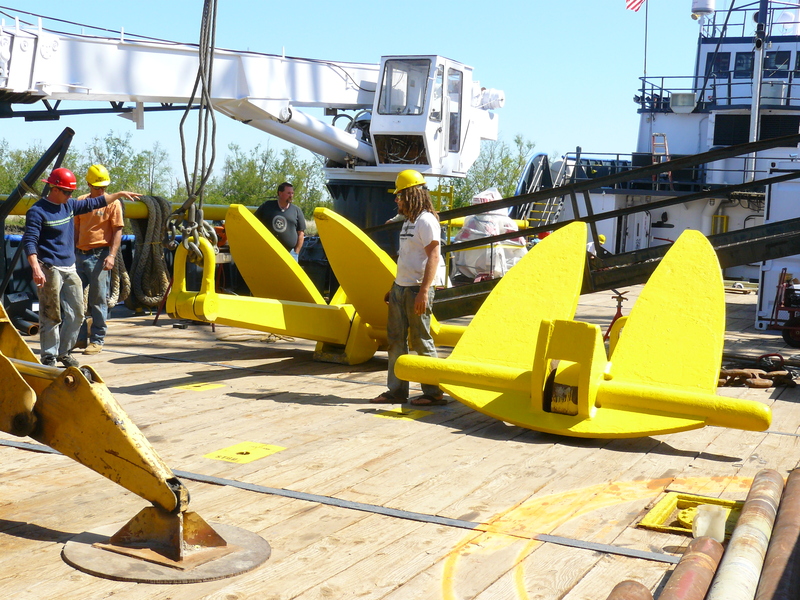 Greg and Gary went to the pilot house as Gary had to maneuver the ship to get it into position to allow the grapple to pick up the anchor. Brian headed to one of the connex boxes on deck that housed the controls for the A-frame and grapple. 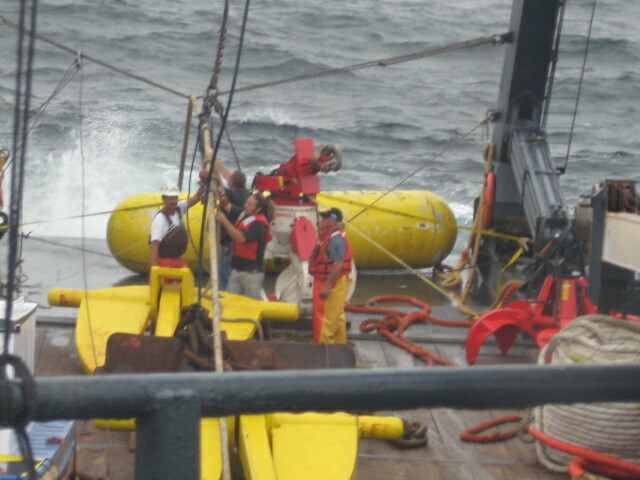 The rest of the crew, geared with hard hats and life jackets headed to the stern of the ship. With radios in hand they began their day . Radios were crucial while doing this kind of work. What the crew could clearly see on the stern, Gary and Brian couldn’t, so Kevin would inform them via radio. Occasionally, Kevin (the deck boss) would come up to the pilot house and discuss with Gary and Greg what was and wasn’t working. They would ultimately come up with an alternative solution. After my work was done I usually headed to the pilot house. From there I could watch and hear what was going on. Though the cameramen were videoing for the Discovery Channel, I would also shoot some video for myself and the company. As I watched the crew from the windows of the pilot house, they never ceased to amaze me. They could be exhausted, upset with one another or have a personal problem at home, but once they were on that deck, it was a different story entirely. They came together as a crew and worked long and hard. They did whatever was asked of them and they watched out for each other. As much as I wanted to find the treasure, I was content at that moment to enjoy the ride. Wonderful accounting of your experiences on the ship. I always look forward to your blogs…looking forward to more exciting adventures!